Mercusys, with its impressive and rapidly growing line of networking products, is establishing a brand presence and taking its distribution network online in countries around the world in the hopes of connecting more people than ever before. The modern world is becoming more connected every day and strong, reliable internet access provides countless opportunities for entertainment, education, communication, and so much more. This access unlocks the unlimited potential that lives in our schools, our businesses, our families, and our communities. Mercusys is committed to developing the simplest, most intuitive, and most accessible products to get you online and help you get the most out of life. 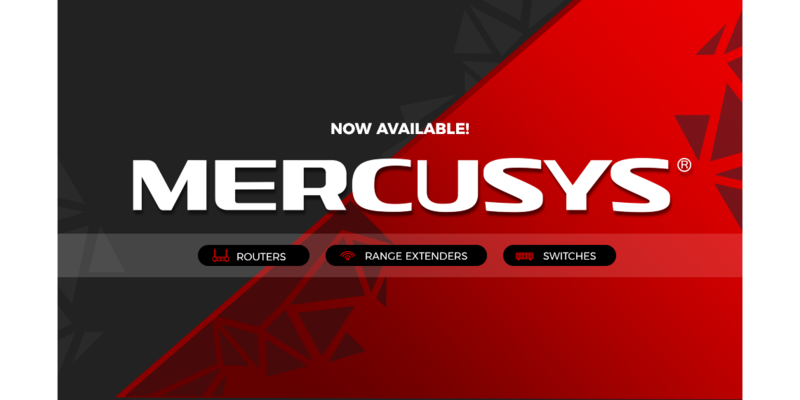 Mercusys offers excellent routers, range extenders, adapters, and switches that make it easy to set up a reliable network for your home. Whether you are interested in streaming HD movies, intense online gaming, video chats with family, or quickly transferring large files between colleagues, Mercusys devices create the network that helps you live a richer, more productive life. A strong dedication to research and development, close partnerships with leading chipset developers, and meticulous attention to detail in the manufacturing process help to ensure that Mercusys products deliver both unparalleled performance and lasting value. The passionate, experienced engineers at Mercusys work closely with their partners at MediaTek and Qualcomm to create products that have the power to improve the daily lives of anyone who uses them. In addition to its extensive, in-house research and development program, Mercusys has established a comprehensive manufacturing infrastructure that allows it to maintain complete technical oversight and implement rigorous quality control standards. The Mercusys name is a symbol of the quality and value that consumers demand in today’s competitive marketplace. Every employee plays an active role and takes tremendous pride in creating products that allow people from around the world to thrive.